Everyone’s talking about the faceless babies in Palm Springs, giant sculptures created by Czech artist David Cerny. 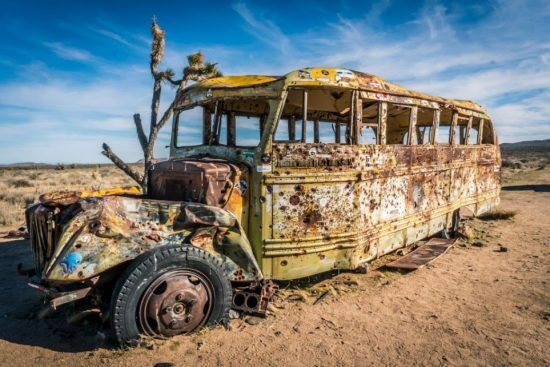 Those who prefer their art organically grown are buzzing about a bullet-riddled homeless school bus that slumbered along the Mojave Road for at least 35 years. As hundreds of visitors stopped to take photos and add their own paint flourishes, graffiti and stickers, this found object evolved into art. Many travelers marked their own journeys by this landmark so it came as a collective shock when it disappeared in March, 2018. People reported the bus missing to Chris Ervin, archivist for the Mojave Desert Cultural and Heritage Association (MDHCA) in Goffs. As reported in the Victorville Daily Press, Ervin set out to track down the beloved artifact. 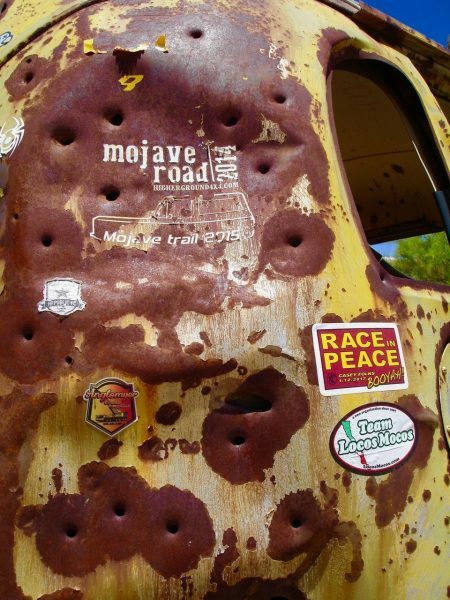 The search led him to the Mojave Desert Land Trust (MDLT) headquarters in Joshua Tree. It turns out the bus had been trailered to the headquarters after MDLT purchased the land where the bus resided; the National Park Service had instructed the organization to remove the junked bus. Now the MDLT and the MDHCA are working together to return the bus to the Mojave Road, a historic route popular with 4×4 drivers. Returned home, the pockmarked bus will again serve as a perfect vehicle for visitors’ own stories of travel, loss and time. 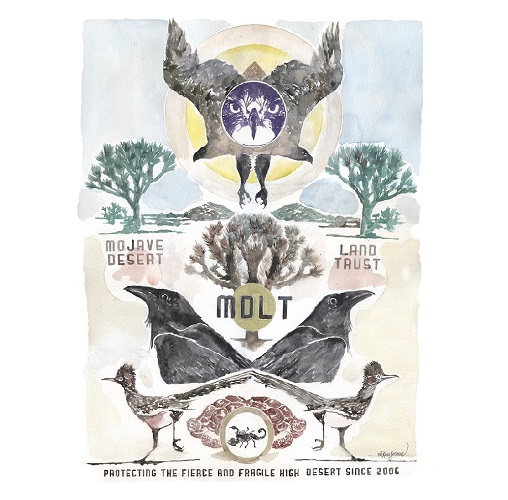 In more news about the Mojave preservation group MDLT, an artist recently featured here, Obi Kaufmann, has designed artworks, T-shirts and onesies exclusively to benefit the fashionable organization. Kaufmann is the creator of the California Field Atlas, a statewide sensation. Grab the opportunity to attire your baby in Obi Kaufmann artwork and support the desert defenders at the same time. 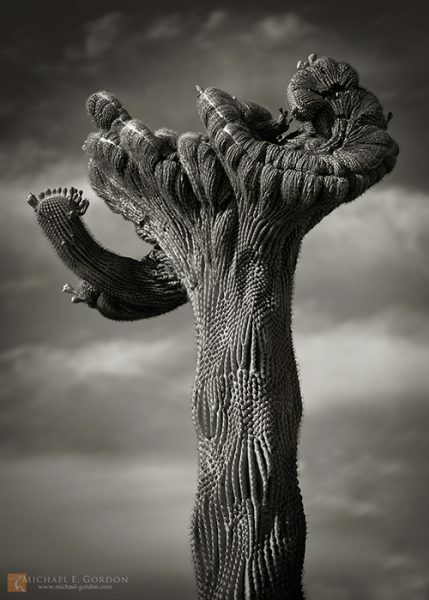 With just one unforgettable photo, landscape photographer Michael Gordon suggests a new retirement hobby for those who are weary of memorizing bird calls: Hunting the mutant crested cactus. The photographer, known for his Death Valley photos and workshops, recently captured this image in Southern Arizona. Michael Gordon photo. An elegant cristate (crested) Saguaro cactus (Carnegiea gigantea) in southern Arizona. The Mojave National Preserve is cropping up in these posts more often as Joshua Tree becomes choked by its own popularity, and Palm Springs cedes to art-as-tourist-attraction. Place-grounded desert artists are instinctively moving toward this more unspoiled park, the Mojave Preserve, and its hub of activity–the Desert Light Gallery in Kelso. 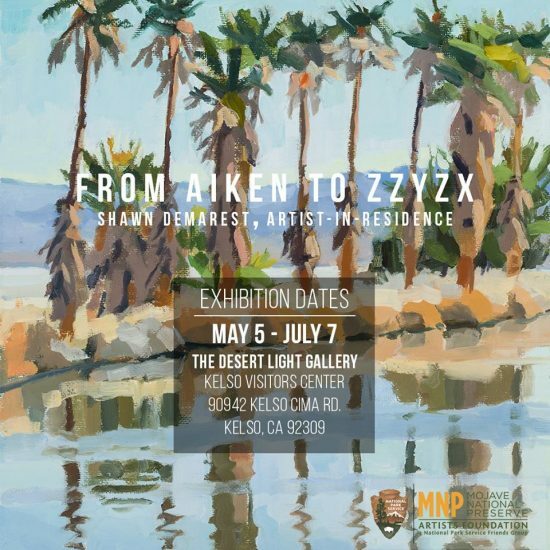 There are a few days remaining (till July 7, 2018) to drive out to the Kelso Visitor Center and see the exhibit Aiken to Zzyzx by visiting artist Shawn Demarest. I would have sworn Demarest was a local (she resides in Portland) given the authentic feeling of these paintings. During her stay in the park, the painter focused on the cinder cone, Dry Soda Lake and Mid-Hills locations. The result is blocky, earthy landscapes and shimmering abstract takes on the Park. The Gallery and the Mojave Preserve Artists Foundation are doing good work in developing and championing desert artists. Take a look at the past artists-in-residency as well as the Foundation’s magazine, Desert Light. In this back issue, saguaro hunter Michael Gordon writes: “The California desert is my ideal artistic habitat” and explains his search for its “secret stories”. Next up for a residency in the 1.6 million acre national park is California artist extraordinaire Eric Merrell. Watch for Eric’s work in a future exhibit at the Desert Light Gallery. Eric Merrell and his painting From Within the Oasis, painted at Thousand Palms Preserve. Seen here at the 107th Gold Medal Exhibition of the California Art Club. While the Phoenix Art Museum celebrates our own Agnes Pelton with a retrospective in 2019 (an exhibit coming first to the Palm Springs Art Museum) the Tucson Desert Art Museum honors another groundbreaking desert woman, Effie Anderson Smith. 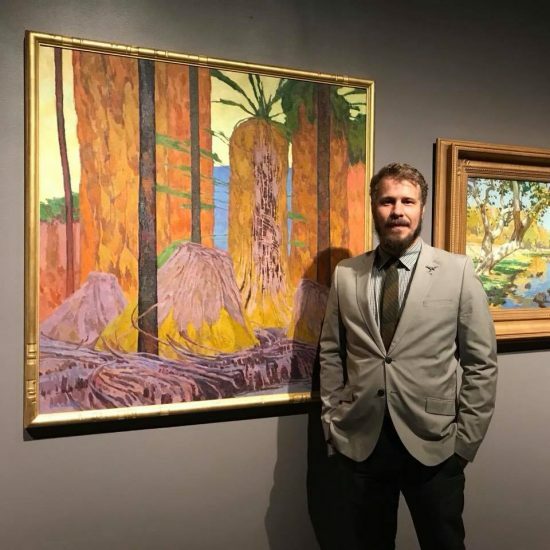 In an article about Effie for this website, her nephew Steven Carlson talked about his efforts to restore the reputation of Arizona’s first nationally known Impressionist painter. Carlson serves as a model of how to publicize a forgotten artist. His tireless enthusiasm for his great-great aunt has resulted in growing awareness among collectors as well as the coming retrospective exhibition–a 150th Birthday present to Effie. Put Agnes and Effie on your to-do list for 2019. Laguna Art Museum celebrates its centennial this year with a new exhibit dedicated to its founders. Art Colony: The Laguna Beach Art Association, 1918-1935 is on view through January 13, 2019. The story of this coastal enclave is closely linked to the story of the less-documented Palm Springs art colony. 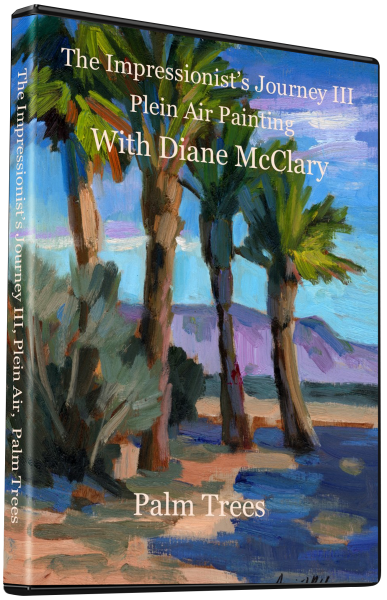 Many early California Impressionists traveled a circuit that included the Sierra, Laguna Beach and the Palm Springs desert. 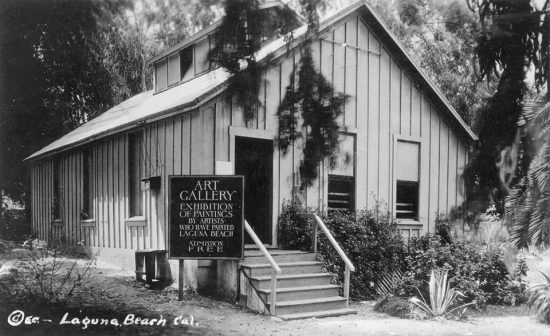 The original Laguna Art Gallery. Some of the major figures in the current exhibit were also major figures in the desert. Edgar Payne, a founder of the Laguna colony, painted the desert, as did Anna Hills. As Laguna celebrates its artists with a series of events and street renamings, it’s a cue to the desert cities to honor our early artists–a scene at least as promotable as giant babies crawling up a hotel wall. An exhibit opening July 7, 2018, at the Twentynine Palms Visitor Center and Art Gallery celebrates one of my favorite subjects: Rocks. The first desert painting I hung on my wall–by Elaine Mathews–was an ode to desert rocks. Later I discovered rock artists like Jane Culp of Anza and Steve Hudson, who often painted Suicide Rock in Idyllwild. This is the first exhibit I know of to expressly honor our inert (seemingly) neighbors. On July 7th from 5:30 pm to 7 pm you’re invited to meet the Rock On! artists and sample catered appetizers, while enjoying acoustic guitar by Trevor Madison. Artists were asked to submit work exploring “the importance of rocks in desert life”. Twentynine Palms Visitor Center and Art Gallery, 73484 29 Palms Hwy, at the corner of Desert Queen Avenue in Twentynine Palms. inspiring, refreshing, thoughtful and heartening knowing that you are out/up there, dear ann, willing to go the distance for art stories! I wondered how that bus came to land over at MDLT, and never crossed paths with it out in the wilderness. I am glad there is an effort afoot to put it back, it looks a bit forlorn in its current enclosure.